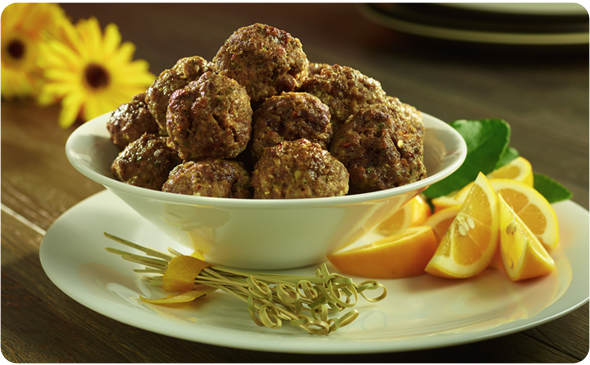 Try this dish with Better Than Bouillon® Premium or Reduced Sodium Roasted Beef Base. Add the bread and milk to a bowl and soak for 10 minutes. Add the garlic, Organic Roasted Beef Base and Roasted Garlic Base to the bowl of a food processor fitted with the steel blade. Pulse for 20 - 30 seconds. Using a rubber spatula scrape the sides of the bowl. Squeeze the milk out of the bread and add the bread to the food processor. Add the eggs, lemon zest, juice, red pepper and parsley to the bowl and pulse for 20-30 seconds more. Add the bread mixture and ground beef to a large mixing bowl. Using your hands, mix the bread mixture and beef together, until combined. Roll the meat into 2-inch size balls and place onto a baking sheet. Place the baking sheet directly into the oven and bake for 20 minutes. Remove the meatballs from the oven and serve with your favorite sauce.